If you’re a regular to this blog you’ll know about my love affair with low calorie products. Whilst there’s always an ongoing debate about their place in a healthy lifestyle I’m always up to try things out and make up my own mind! I’ve tried quite a few different brands of sugar free sauces, including the ever popular Walden Farms. 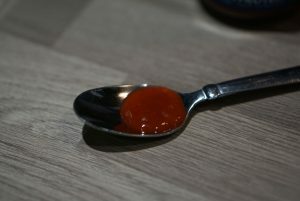 Big brands like Heinz are taking notice too, with their 50% less sugar Tomato Ketchup a regular in our household. 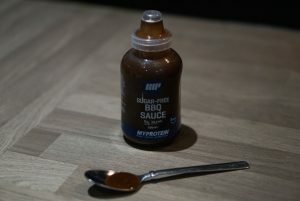 So when I saw these new MyProtein Sugar Free Sauces I threw a couple straight in my basket and went on my merry way. Now they’ve arrived, it’s time to see how they stack up! 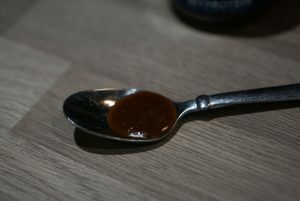 Ah BBQ sauce, what is life without it hey? BBQ sauce is one of those products that ranges so greatly in taste from brand to brand, so I kept my expectations open about this one. I have to say I did quite like it, it has a really sharp but sweet taste, it’s not bland and it doesn’t taste too chemically. The consistency is good, and at 5cal a serving it’s definitely more diet friendly than big brand alternatives. 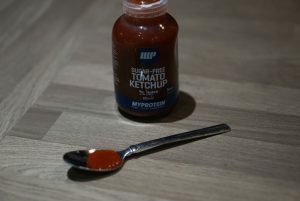 I think MyProtein has done a good job on this one, I’d definitely buy this one again. Tomato Sauce is such a dangerous product to emulate. I’ll admit it, I am 100% a Heinz fanboy, so I knew this was gonna face tough critic to win me over. I find the mix of herbs a bit odd, maybe it’s the Rosemary over powering things a little? I actually think it tastes OK, but it’s just too much of a stretch from “normal” tomato sauce for me. And whilst the low kcal makes it an attractive offer, I’d still rather stick to my 50% less Heinz. So there you have it my friends, I wonder if MP will bringing any more flavours out for this line?